THREE PEOPLE HAVE been killed and more than 600 people have been injured after two passenger trains collided head on during in South Africa’s capital city Pretoria. Another 641 people were hurt, with 11 sustaining critical injuries and 62 suffering “moderate” injuries. Rail accidents are common in South Africa. In 2016-17, 495 people were killed on the country’s railways, according to the Railway Safety Regulator. Transport Minister Blade Nzimande said the accident was caused by signals failure which he blamed on cable theft. “I’m truly saddened about this continuing deaths of commuters at Metrorail,” said the minister after visiting the scene of the crash. “I’m personally outraged … we can’t every time be having the repeat of the same problem. “As government, we have to bring this to end. We need more stringent measures to be able to deal with this situation. “We need to find a way of dealing with rail safety,” he said, demanding explanation from the country’s rail agency. The theft of railway cables is a continuing problem in the country. They are often melted into ingots before being smuggled to Asia. Khanyisile Kweyama, the chairwoman of the board of the Passenger Rail Agency of South Africa, admitted that the security of rail signalling cables “hasn’t been” great. 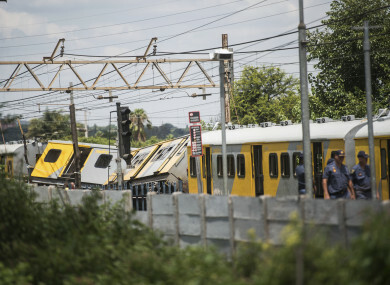 Email “Three killed and over 600 injured after two passenger trains collide in South Africa”. Feedback on “Three killed and over 600 injured after two passenger trains collide in South Africa”.